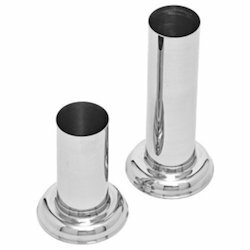 Leading Manufacturers and Exporters of Hospital Holloware products like Bedpan, Douche Can, Mugs, Bowls, Trays, Stainless steel surgical medical equipment,medical utensils are utilitarian items, urinals, surgical instrument trays, gallipot & sputum mugs, dressing drums, forceps jars etc. The range of dressing drums we make available in the market are used in various hospitals for storing different dressings and other medical equipment. 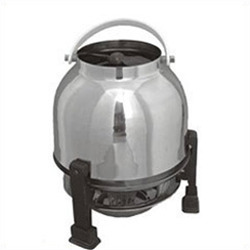 These drums are manufactured from high grade stainless steel and its lower body is perforated. 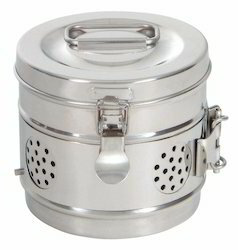 Offered with a snap fitting lid, these drums are available in different sizes according to the particular requirements of our global clientele. 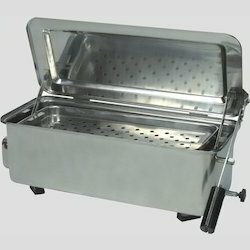 Surgical Trays which are made from high grade stainless steel. These are extremely durable. The surgical trays, as the name suggests are used for holding various surgical instruments like forceps, blades, knives etc. 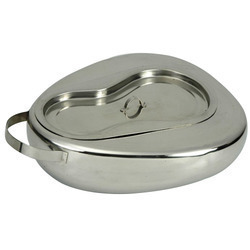 Available sizes : 6", 8", 10", 12"
These trays are highly durable and corrosion free. These are often utilized in various health care establishments during surgeries for holding tools and related items. We make these trays available in the markets in two different models, that is with and without lid and also in various sizes. These are available in plane immersion heater, also available with thermostat & tray listing arrangements. These can be made as per customer requirements in different thickness & different quality of sheet with minimum quantity. Fumigator converts formalin in to Aerosol from which is 100% biocidol with an adequate of penetrability to distroy every spores. Fumigator works with an amazing quickness. Its powerful machanism instantly converts liquid formalin into true aerosol particles. The portable handy and easy to operate unit can be handled by any staff member or even a room boy. There is virtually no maintenance required. Every Fumigator passes through stringent quality control tests at various stages of manufacturing before it reaches the end customer. - Which made them 100% rust free and long life. patients at hospitals and home. 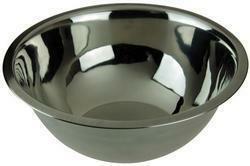 Hospital BowlsWe offer high quality Bowl, Basin and Gallipot. All these products are made from stainless steel sheets in different sizes. These can be made as per customer requirements in different thickness & different quality of sheet with minimum quantity. Basins: • 10" • 12" • 14" • 16"
Bowls: • 4" • 5" • 6" • 7" • 8"